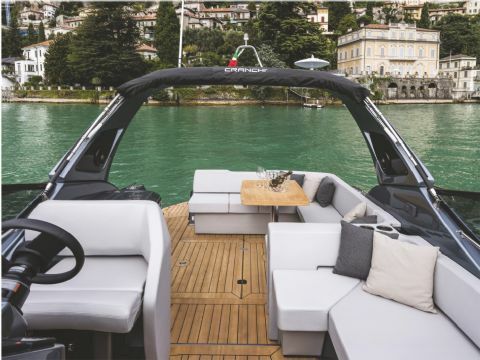 Water distribution system directly from the dock - Roll-up foldaway hose - Grey water: shower collection system - Acoustic and visual alarm on the dashboard for water in bilge - Bruce anchor 15 kg - Interior Deluxe version - Engine/on-board service batteries n°3 - Electric boiler 25 litres - Magnetic compass - Automatic battery charger 35 Ah 3 output - 50 meters 8mm chain - Antiflame blanket - Volvo Penta blade trim tabs - Cockpit shower - Fire extinguishers: 2 automatic in engine room and 1 manual in the cockpit - Cabin refrigerator 65 litres - Electric system 12V/DC 230V/AC - Boat hook - Saloon floor in wood with anti-scratch and anti-mold pre-treatment - Water pump - Stainless steel aft fender holders for 6 fenders - Shore power 32Ah with cable - Radio Fusion with control in the cockpit and upgrade (speakers on the foredeck and subwoofer) - Teak cockpit table convertible into sunpad including cushion - Foldable saloon table - Teak laid part of the cockpit - Cabins' curtains - Windscreen wiper - Hydraulic steering and electronic engines controls - Electric winch 800W - Electric marine WC - Mosquito net - Blind on deck hatch bow cabin - Mosquito nets on portholes - Waste water tank - Air conditioning system 16.000 BTU with heat pump - Complete hood (with bimini) - Bow sunpad cushion with storage and cover - Bow thruster with automatic fire extinguisher - Cockpit refrigerator - Colour G.P.S. Chartplotter Garmin series display 10" - 3,5 KW Generator - Multi-instrument DTS (depth-temperature-speed) integrated in the helm position instruments - 2 Saloon roof window blinds - Autopilot Garmin - Teak laid swimming platform - Teak laid cockpit - Cockpit cover - Trip Computer, cruise control, single lever control, power trim assistance - VHF/DSC Garmin - CE Certificate and declaration of conformity - Antifouling black - Electric cockpit grill - Interior furniture glossy lacquered - Exterior upholstery Silvertex - Hull, deck, and roll bar lacquered - Preparation and delivery - Transport from production site. 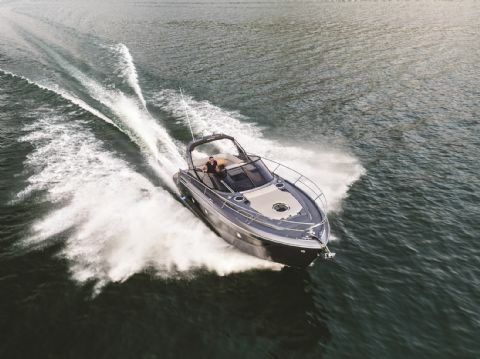 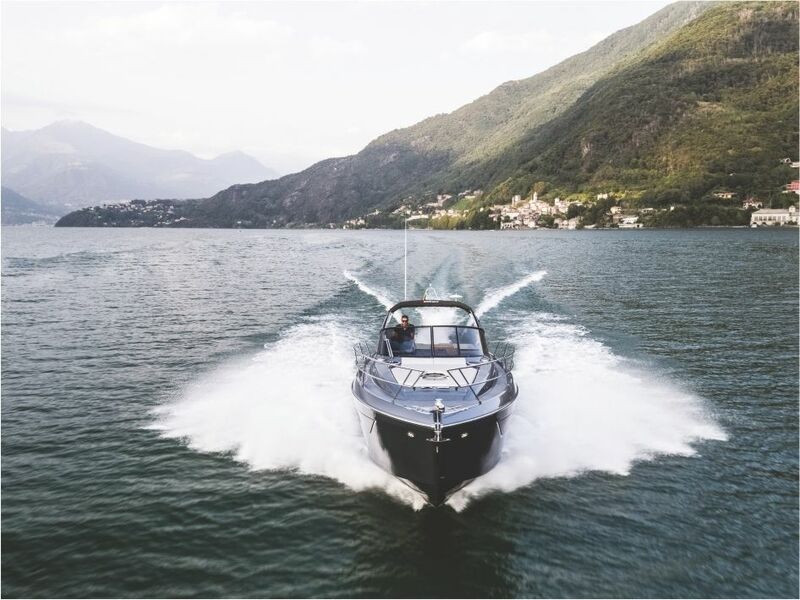 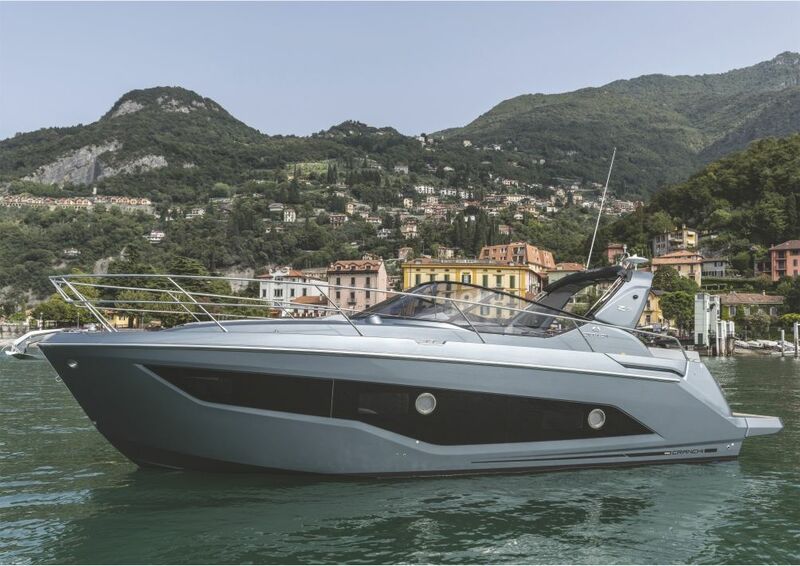 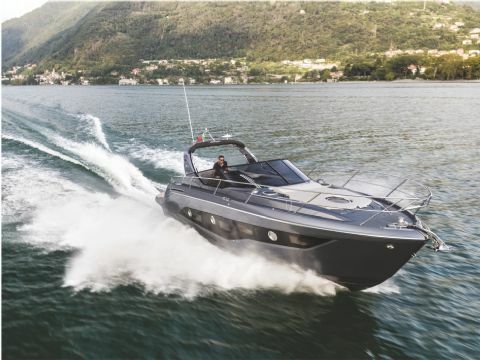 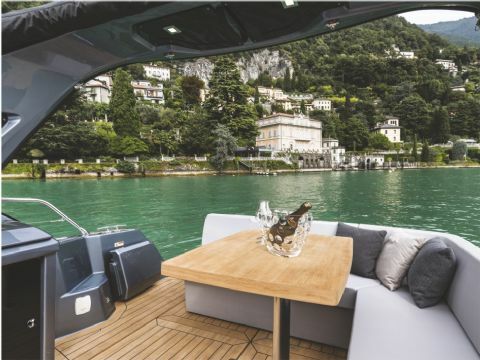 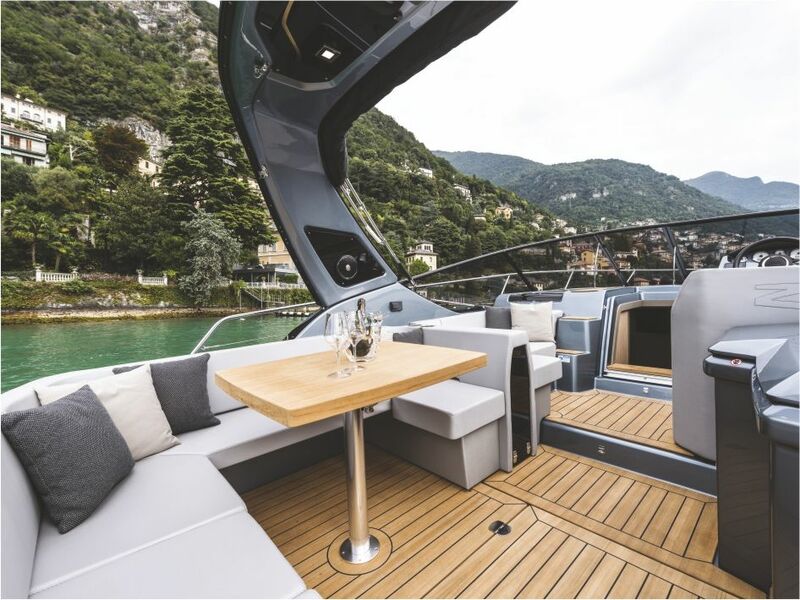 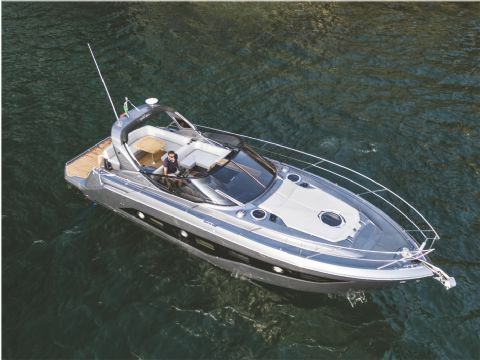 This model from Cranchi is much bigger than a 35 feet: she is 11,70m long and perfect for cruising with family and friends. 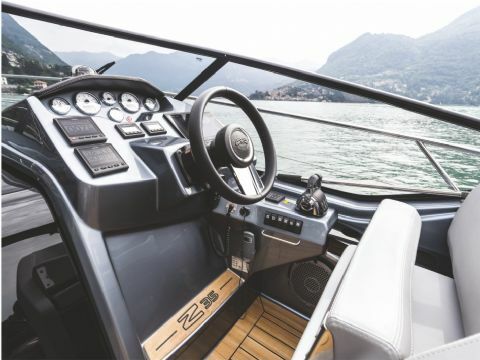 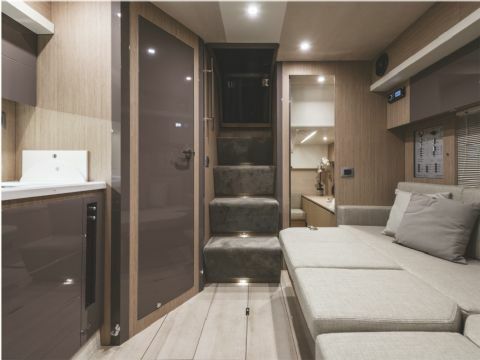 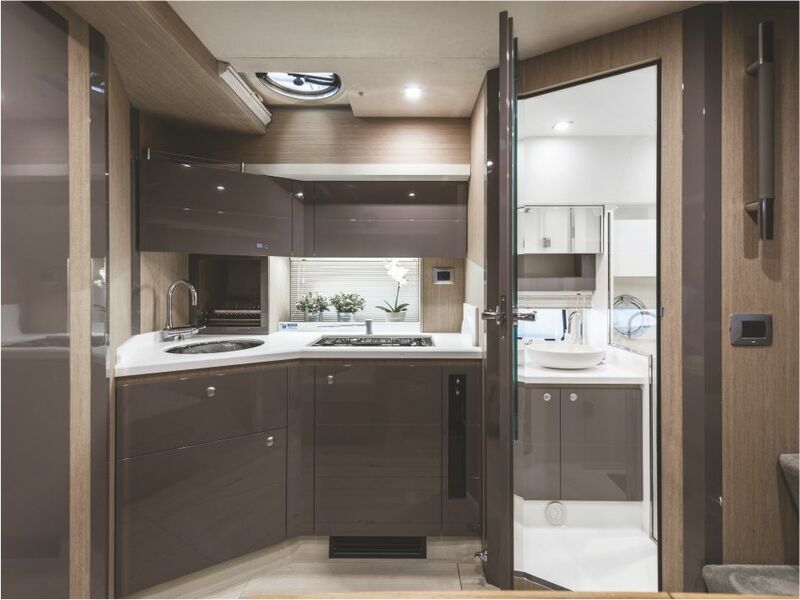 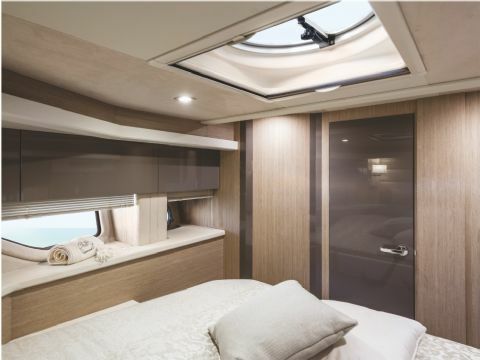 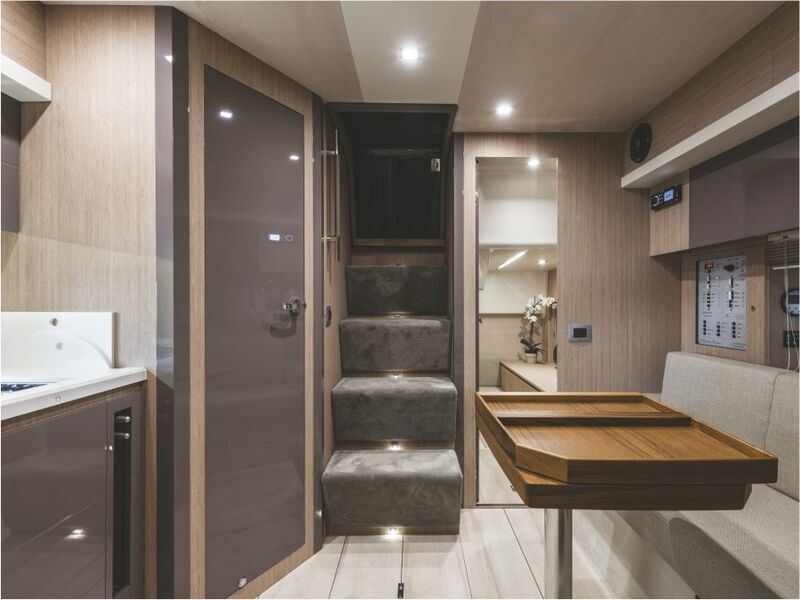 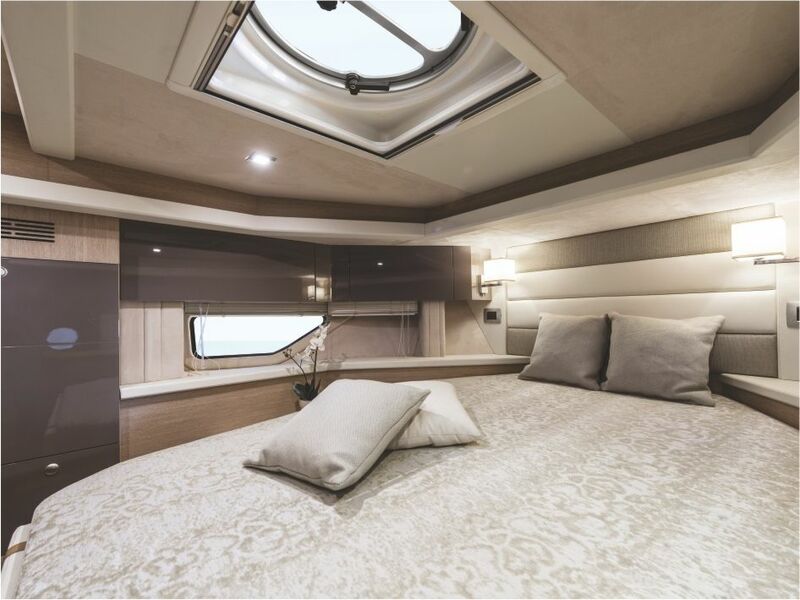 The forward cabin with a walk-around double bed is quite high and has many storage compartments. 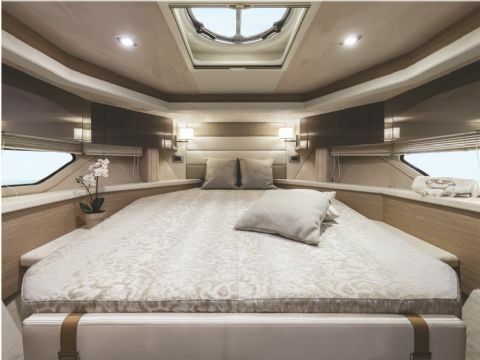 In the other cabin, there are two small beds that convert in a large double bed with the addition of a cushion. 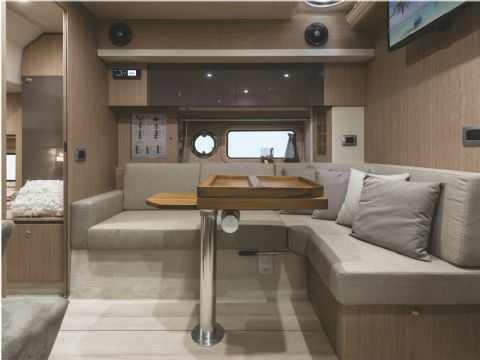 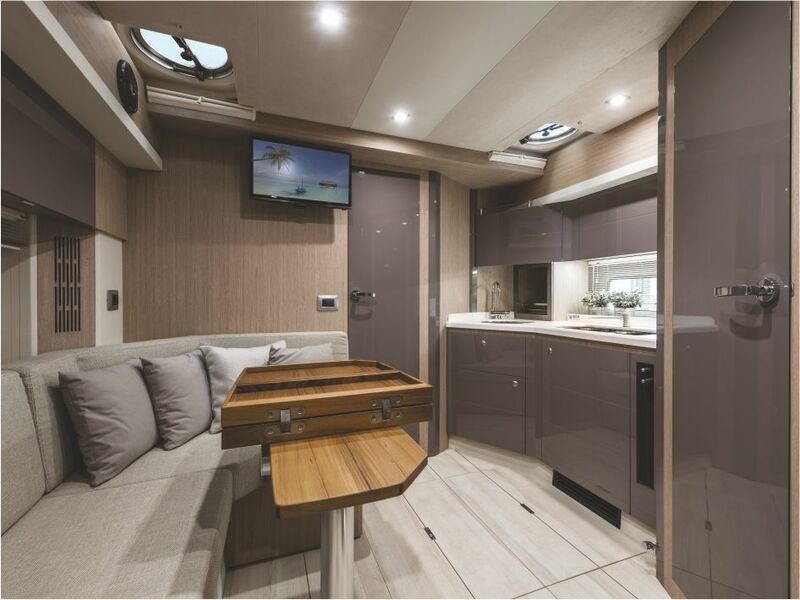 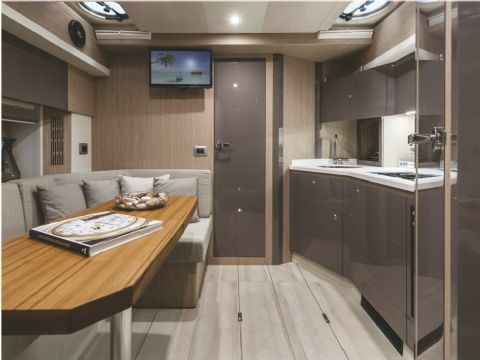 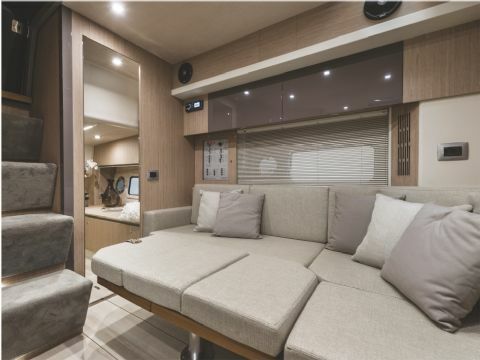 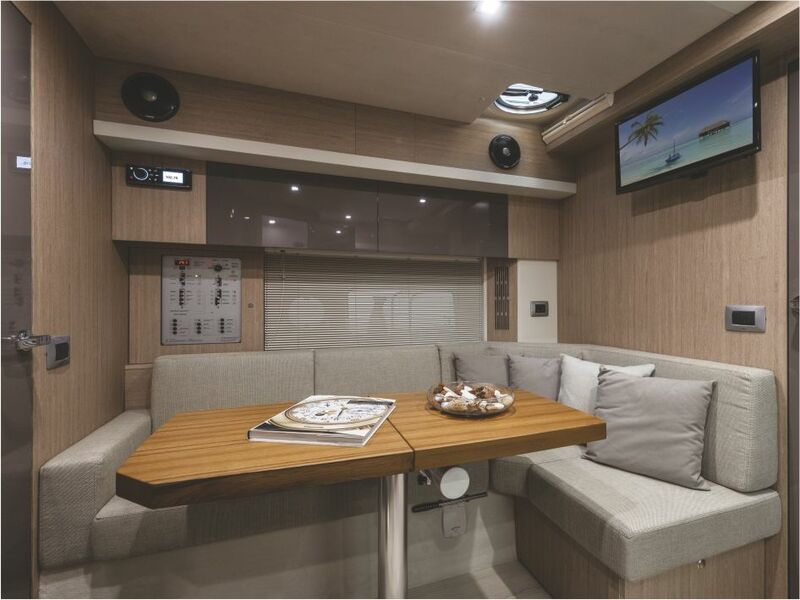 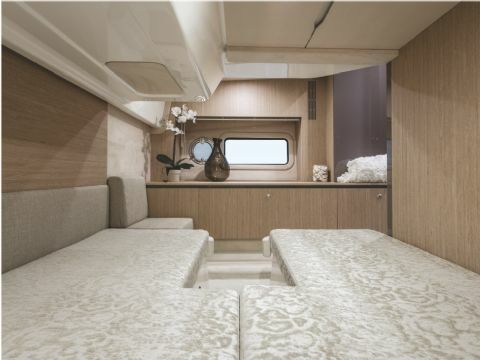 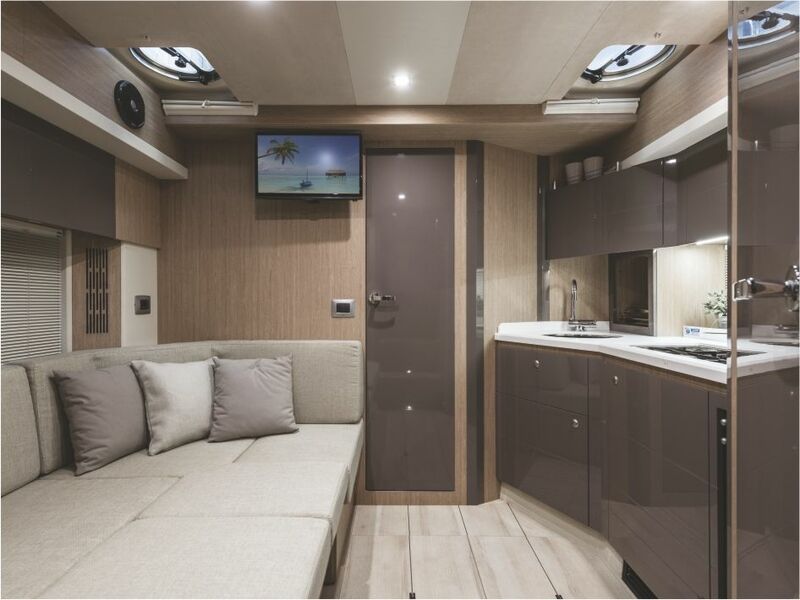 The dinette also converts into a berth for two. 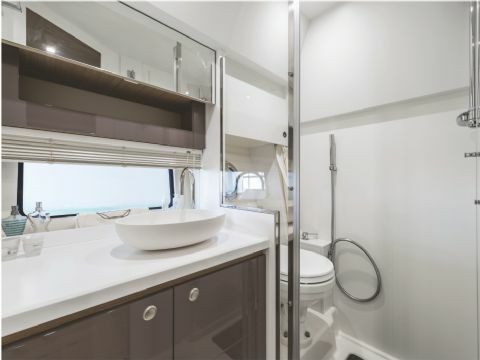 The WC is nice and high with a shower separated by a partition. Outside, the cockpit is very wide and can accomodate more than 6 people in a wide area that includes a table and sofa convertible into sunpad, as well as a barbecue area. There are various sunbathing areas and this unit is very well equipped. VAT not included. Registration and law-binding safety kit not included. Price from 244.500€ + TVA.